While an e-cigarette and e-liquid are all you really need in order to vape, there are a few items that make the whole experience a bit easier. These basic items are useful for vapers at any level of experience. It never hurts to have a few extra cartridges, cartomisers or clearomiser coils on hand. This way, you have a back-up plan if something rolls under the refrigerator or you receive a dud. We’ve all been waiting on Ozpost in this situation! Paper towels are indispensable tools for vapers. Not only do they provide a quick, easy way to wipe up e-liquid drips and spills, but they are also perfect for cleaning up leaky or flooded atomisers. It’s also a good idea to keep a roll near your charger so that you can clean the contacts on both your battery and charger frequently. While most e-liquids come with a dropper cap, some are too large to fill a cartomiser or clearomiser comfortably. A pointed eyedropper or blunt-tipped syringe makes it much easier to aim e-liquid into narrow openings. It is a good idea to clean your drip tips, clearomisers, tanks and other equipment periodically. Pipe cleaners or small bottle brushes can reach inside nooks and crevices to remove gunk, lint and other build-up. A small, flat-tipped screwdriver, such as the ones that come in eyeglass repair kits, is handy to have around if the center pin in your battery gets stuck. This is a common issue with eGo-style batteries. You can use the screwdriver to lift the pin, very gently, back to its normal position. A tiny screwdriver is also helpful for removing pocket lint and other debris from the area around the battery connector, ensuring a good connection. These small, utilitarian twists of wire are ubiquitous among vapers for a reason: you can use them for almost anything! Straighten out a clip to remove the white rubber caps from clearomisers. Use them to remove gunk that builds up around your battery connector. Widen the opening in a too-small dropper cap to improve the flow of thick e-liquids. Unsure whether you need a 1.8-ohm cartomiser or a 2.2-ohm one? A resistance chart, such as this one, provides an easy way to ensure that the resistances of your replacement cartomisers, coil heads and other atomisers are compatible with the voltage of your battery. 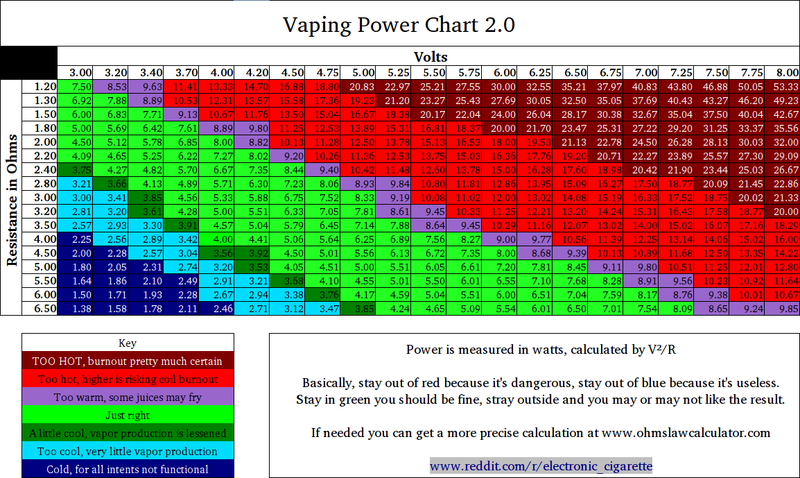 Keep a copy of this chart handy on your tablet or smartphone, or print it out and store it with your other vaping supplies. It’s a good idea to store all of these tools in one convenient location. Any sturdy, stable container will work. Many vapers use fishing tackle boxes to store their e-liquids and tools. The handy compartments and dividers make it easy to organize your supplies. A locking box is best if you have children or curious pets in your home; store it in a high cabinet or other secure location. You can definitely enjoy vaping without any of these items, but you’re never going to regret having a well-stocked kit on hand when the need arises.